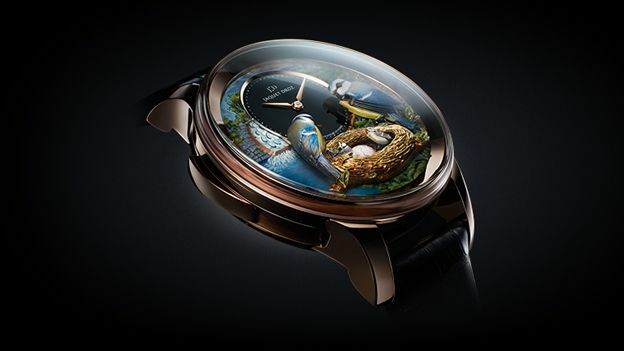 The watchmaker has released the limited edition Bird Repeater Geneva to celebrate the city that was introduced to Pierre Jaquet-Droz timepieces in 1784 - when his first clockmaking manufacturer was established in the city. It's no surprise then, that it depicts many of Geneva's famous landmarks. Lake Geneva, the Jet d'Eau fountain, lighthouse Le Phare des Pâquis, and the pre-Alpine peak 'le Salève' all feature in the backdrop. Meanwhile, a pair of mechanical goldfinches go about their business in the foreground, nursing two of their young sitting with a cracked egg. The birds themselves are hand crafted from gold, set into mother or pearl - a stark contrast to the simplicity of the clock itself, which sits on a black dial above the nest. Behind the scenes, the Geneva features an RMA88 automatic winding movement - with a 48-hour power reserve - that powers the movement of the goldfinches, as well as the dial itself. If you fancy stumping up close to $500,000 for one, it comes in 18k red or white gold (the red gold is slightly cheaper, leaving you with money left-over for couple of new cars). But there's only eight being made so... good luck with that.